The 2009 studio album of original songwriting by the Baltimore-Based acoustic trio brings an eclectic variety of influences; everything from bluegrass to rock-n-roll to folk to electric improvisaton, with superb vocal blends. 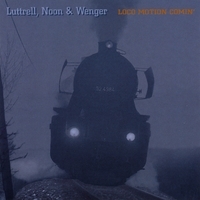 Two and a half years after their first album “Scorched Sentiments”, LUTTRELL, NOON & WENGER return to the recording studio for their eclectic new 2009 release, LOCO MOTION COMIN’. This album offers a wide range of influences and styles, all connected to its respective primary band members, Andrew Luttrell, Skip Noon & John Wenger; including bluegrass, rock-n-roll, folk, electric jazz-fusion, and improvisation. Once again, impressive original material by singer/songwriter Andrew Luttrell (also a full time founding member of THE COAL MOUNTAIN RAMBLERS and his electric rock-n-roll band ECHOSEVEN) combined with songs written by songwriter/co-producer talent Skip Noon (long-time acoustic partnership with vocalist John Wenger) bring a pleasing combination of acoustic/electric music. Original band mate Dave Hadley from their first album returns playing Pedal Steel, Eugene Yun joins the group on violin, and ECHOSEVEN drummer Craig Carmen appears as a special guest on 11 songs. Excellent lyric/songwriting coupled with top-quality musicianship equals a great album, and these guys prove it once again. There is something here to be enjoyed by all kinds of music fans. CD includes full lyrics booklet. Part of the proceeds from the sale of this compact disc serve as a donation to Multiple Sclerosis research. Recorded at Glen Arm Studio, Baltimore, Maryland: February 2008 – February 2009. Produced by Andrew Luttrell and Skip Noon. ANDREW LUTTRELL: Vocals, Electric Guitar, Acoustic Guitar, Piano, Organ, Mandolin, Harmonica. SKIP NOON: Vocals, Acoustic Guitar, Banjo, Bass Guitar, Piano, Slide Guitar. DAVE HADLEY: Pedal Steel, Dobro. CHRISTIAN SEMICH: Violin on “Gypsy Magic Workin”.